With Todd Landman, Rhona Smith, and Zhang Wanhong. 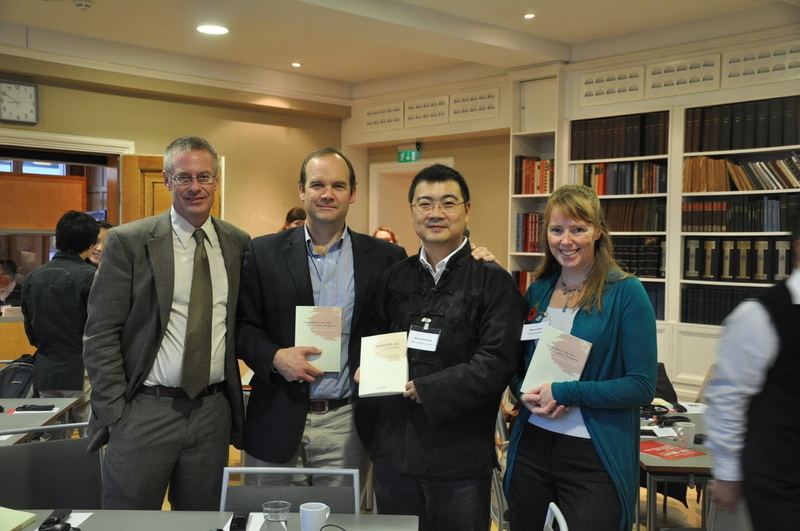 Holding our edited book, Human Rights in Our Time: Multidisciplinary Perspectives. Published by Beijing Legal Press. Joyful Human Rights. Forthcoming from University of Pennsylvania Press. In popular, legal, and academic discourses a subtle but significant shift has occurred: the term “human rights” is now almost always discussed in relation to its opposite, “human rights abuses.” Syllabi, textbooks, and academic articles focus largely on abuses, victimization, trauma, and occasionally resilience. Yet, abuses or even resilience fail to encompass “human rights” or the lives of those victimized. Those victimized almost always experience a panoply of human emotions including happiness and joy, and human rights should also be discussed in the context of the most joyful of human experiences. Human Rights Law and the Marginalized Other. Cambridge University Press, 2011 (978-1-107-01007-9). An-archy and Justice: An Introduction to Emmanuel Levinas's Political Thought. Lexington Books, October 2003 (0-7391-0703-8). Binational Human Rights: The U.S.-Mexico Experience. Co-Editor with Carol Mueller. University of Pennsylvania Press. 2014 (978-0-8122-4628-5). Human Rights in Our Time: Multidisciplinary Perspectives. Co-Editor with Todd Landman and Rhona Smith. Norwegian Centre for Human Rights and the Raoul Wallenberg Institute of Human Rights and Humanitarian Law. Originally Published in Chinese. Human Rights Voices. Under contract with Routledge, lead editor with Sheila B. Keetharuth, Rhona Smith, Semere Kesete, Devorah Wainer, Kaitlin Murphy, and Asya El-Meehy. Proposed here is a general textbook, Human Rights Voices, containing original contributions from those most affected by human rights issues, including victims, activists, attorneys, government officials, perpetrators, and volunteers. For the first time, students will hear directly from these key stakeholders who live daily with human rights challenges and violations. Indeed, the contributors will write their selection in the form of a letter to college students (e.g., Dear Student of Human Rights). The contributors will tell their personal story, and will be encouraged to write about the larger lessons from their experiences that any student studying these issues should know. Contributors will also be asked to offer additional sources that students might consult, including other stakeholders, links to websites, videos, and books. Many contributors will also suggest ways that university students can get involved in their issue. “Immigration Enforcement, the Racialization of Legal Status, and Perceptions of the Police: Latinos in Chicago, Los Angeles, Houston, and Phoenix in Comparative Perspective” Forthcoming in DuBois Review. With Cecilia Menjívar, Daniel Alvord, and Elizabeth Salerno Valdez. “Moments of Negation, Duration, and Human Rights Law without Judges” in Teoria e Critica della Regolazione Sociale. 2: (2015) 79-96. “Privatization of Prisons in Israel and Beyond: A Per Se Violation of the Human Right to Dignity” Santa Clara Journal of International Law (2015) 13 (2): 487-515. With Leonard Hammer. “Violence and Vulnerability of Migrants in Drop Houses in Arizona: The Predictable Outcome of a Chain Reaction of Violence.” Violence Against Women (2015). 21 (5): 551-570. With Michelle Téllez and Cecilia Menjívar. Culpability, Social Triage, and Structural Violence in the Aftermath of Katrina” Perspectives on Politics.10 (2012). With Monica J. Casper. “Enrique Dussel and the Individualized Saturated Other.” Listening: Journal of Religion and Culture, 43 (2008): 26-37. “Liability of Secondary Actors under the Alien Tort Statute: Aiding and Abetting and Acquiescence to Torture in the Context of the Femicides of Ciudad Juárez.” Yale Human Rights & Development Law Journal 10 (2007): 88-140. “Remedies for the Women of Ciudad Juárez through the Inter-American Court of Human Rights.” The Journal of International Human Rights 4 (3), (Spring 2006): 492-517. “Concrete Abstractions and the Rights of Man.” Subject Matters 3(1), (2006): 113-20. “Beliefs in Conspiracy Theories among African Americans: A Comparison of Elites and Masses.” Social Science Quarterly 86 (3), (September 2005): 582-98. With Sharon K. Parsons. “The Determinants of Satisfaction and Turnover among Nursing Assistants: The Results of a Statewide Survey.” Journal of Gerontological Nursing 29 (3), (2003): 51-8. With Sharon K. Parsons, Katherine Penn, and Melanie Furlough. “Zionism, Place, and the Other: Toward a Levinasian International Relations.” Philosophy in the Contemporary World 7 (1), (Spring 2000): 21-25. “The Third: Levinas's Theoretical Move from An-archical Ethics to the Realm of Justice and Politics.” Philosophy and Social Criticism 25 (6), (1999): 85-106. “Testing the Grapevine: An Analysis of Conspiracy Theories in the African-American Community.” Sociological Spectrum 19 (2), (1999): 201-222. With Sharon Parsons, John Kilburn, and Frankie Shinhoster. “Re-examining the Racial Threat Hypothesis: Black Voter Registration in Louisiana, 1975-1996.” The Journal of Black Studies 29 (6), (1999): 755-770. With William Arp, III and Christopher E. Cottrell. “The Human Right to Dignity and Commodification of Prisoners: Considering Worldwide Challenges to Prison Privatization” with Leonard Hammer, in Privatization, Vulnerability, and Social Responsibility, edited by Martha Fineman, Ulrika Andersson and Titti Mattsson. New York: Routledge, 2017..
“Reproductive Justice and Resistance at the U.S.-Mexico Borderlands” Forthcoming in Radical Reproductive Justice: Foundation, Theory, Practice, Critique, edited by Loretta Ross, et al. Feminist Press, 2017, with Anna Ochoa O’Leary. “Levinas’ Divine Comedy and Archbishop Romero’s Joyful Laughter” in Ethics on the Brink: Running the Risk of Comedy in the Philosophy of Emmanuel Levinas, ed. by Brian Bergen-Aurand. Duquesne University Press, 2017. “Calculated Losses: Measuring Infant Mortality, Discounting Women’s Lives” in Counting on Marilyn Waring. Demeter Press. With Monica J. Casper. “Sexual Violence against Migrant Women and Children in Arizona” In Binational Human Rights: The U.S.-Mexico Experience. Co-Editor with Carol Mueller. University of Pennsylvania Press. 2014. with Michelle Tellez. "Multiple States of Exception, Structural Violence, and Prospects for Change" In Binational Human Rights: The U.S.-Mexico Experience. Co-Editor with Carol Mueller. University of Pennsylvania Press. 2014. “Making the Teaching of Social Justice Matter” in Real Social Science. Forthcoming from Cambridge University Press, edited by Bent Flyvbjerg, Todd Landman, and Sanford Schram. 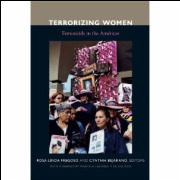 “Innovative Transnational Remedies for the Women of Ciudad Juarez.” In Terrorizing Women: A Cartography of Feminicide in the Américas edited by Cynthia Bejerano and Rosa-Linda Fregoso. Duke University Press, 2010. With Rebecca Coplan. “Levinas and Voegelin on the “Foundations” of Politics and Ethics: Transcendence and Immanence Reconsidered.” In Cecil L. Eubanks and Peter A. Petrakis, eds. Eric Voegelin's Dialogue with the Postmoderns: Searching for Foundations. The University of Missouri Press, 2004. “Introduction.” Litigation Guide for Human Rights Defenders, Geneva: International Service for Human Rights, 2004. With Julia Harrington. Book Review of Liberalism without Perfection by Jonathan Quong. December 2012. Perspectives on Politics 10 (4): 1063-64. “I’m migration: Evolving Principles and Practices in Social Justice and the Arts from Diverse Voices in Campus-Community Spaces” With Melanie Ohm and Judy Butzine. “Claude Lefort” and “Georges Gurvitch.” Companion to Modern French Thought. Fitzroy Dearborn, 2003. “Johann Gottlieb Fichte”, “Friedrich Engels”, and “Theodor Herzl.” The Encyclopedia of Nationalism. Academic Press, 2000. “Black Conservatism”, “Civil Rights Act of 1960”, “Niagara Conference”, “Tureaud v. Board of Supervisors”, “Ida B. Wells Club”, “Henry McNeal Turner”, “Humphrey-Hawkins Full Employment and Balanced Growth Act of 1978.” The Encyclopedia of Minorities in American Politics. Oryx Press, 1999.